Pilots and dog lovers unite! The Pilot and the Dog in orange and blue is an extraordinary petit mobile that brings together the spirit of adventure with whacky canine-loving humour. 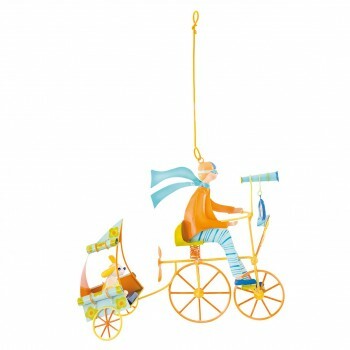 When Catherine the designer at L’Oiseau Bateau created the Pilot and his Dog, she had in mind the dog actually being chauffered in his office by his crazy driver. The concept is fun, loveable and immediately brings a smile to all who see it. Perfect as a decor piece in a child’s room or nursery, the Pilot and his Dog is also a gift that can be appreciated by adults of any age, too. Please note, this is not a toy it is a decoration only. We have one only of this item and can not take back orders.